Feed Me Bubbe is all about taking you into Bubbe's kitchen. Based upon the popular online and televised kosher cooking show seen all over the world this book includes all of Bubbe's classic recipes, insights, and stories that are sure to touch the heart. Her voice and wisdom come across each page through a format that makes cooking fun and comfortable for any skill level. Discover Bubbe's favorite Yiddish songs and create menus that will be sure to please any palate. 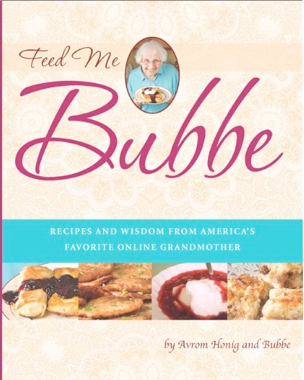 This is a must purchase for any fan of Feed Me Bubbe and anyone interested in experiencing the feelings, memories, and tastes of being a part of Bubbe's kitchen. So pull up a chair, sit down, have some chicken soup, and as Bubbe says at the end of every episode "Ess gezunterhait!" Eat in good health.